I’m very new to this so please forgive my booboos. Here’s a little picture. 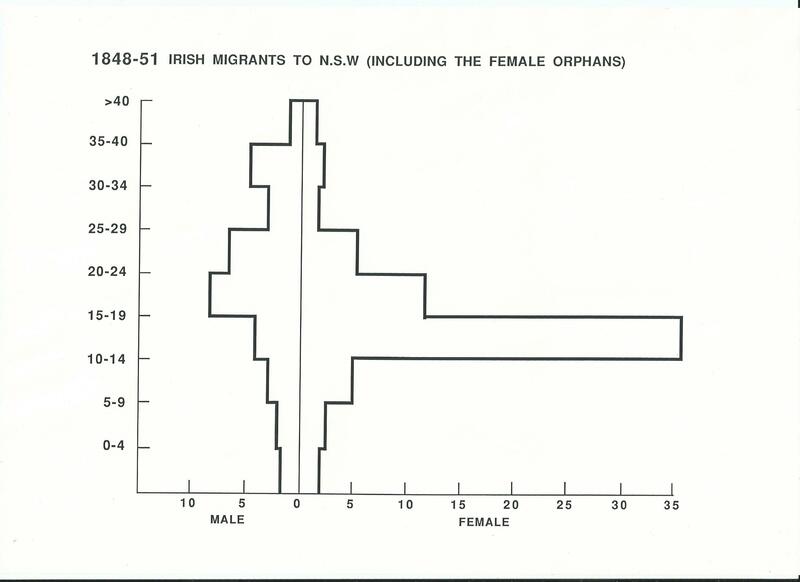 Note the bulge in the graph, the percentage of 10-24 year old Irish female migrants arriving in New South Wales. This is explained by the arrival of c. 3,500 famine orphans from Irish workhouses who came to Port Jackson and Port Phillip between 1848 and 1850. It does not include the 600 who sailed into Port Adelaide. There were 4114-4175, mostly adolescent females in all, who came as part of the “Earl Grey Scheme”. Viewing a graph like this illustrates just how remarkable a feat of British Imperial social engineering the Earl Grey scheme was. One can imagine the conversation at the centre of power. “Do the Australian colonies need more females? Yes, well let’s send them some from our workhouses.” Not that it was ever as simple as that. Where did the idea come from? It was not completely new. An important precedent was set during the 1830s when young women, many of them from both Irish and English Foundling Hospitals, Houses of Industry and other charitable institutions, were brought into New South Wales and Van Diemen’s Land. The aim of the British Imperial government, as Lord Howick put it, was to “encourage the emigration of females“‘ “to remedy what is so very serious an evil in its present condition (the disproportion of the sexes)“. (Howick to Treasury 16 Feb 1831, quoted in British Parliamentary Report of 1835). This motive was still very much in evidence in 1848. As indeed was the speed with which commentators in both Britain and Australia stereotyped such female emigration as “being injurious to the best interests of the colony” (J. Eckfort, Surgeon on board the Duchess of Northumberland, giving evidence to the Parliamentary enquiry in 1835). His sentiments echoed those of the Presbyterian Minister, Reverend J. D Lang, who earlier that same week had asserted to the Enquiry that “the female emigrants sent out by Government…although many of them have conducted themselves reputably, and are now comfortably settled, their general influence on the morals of the colony has been decidedly and highly unfavourable”. (On the fifteen vessels which came from Ireland and England in the 1830s see A. J. Hammerton’s essay in (Australian) Historical Studies in October 1975 and more recently, Liz Rushen’s books. Her Colonial Duchesses, on mainly Irish women, was published by Anchor Books in 2014. See her website www.rushen.com.au ) This early government scheme for bringing women to Australia had finished by 1836. There was, however, an enormous influx of Irish women as Bounty migrants in the early 1840s. Between January 1841 and June 1842 almost 17, 000 Assisted Irish immigrants arrived in New South Wales. More than half of them were female. The authorities were hard pressed to find accommodation and employment for such a flood of people. Caroline Chisholm, “The Emigrant’s Friend”, is deservedly renowned for her work with these immigrants. She met them at the wharves, advocated for, and set up a Female Immigrant’s Home and employment agency, promoted the establishment of depots at Liverpool, Parramatta, Campbelltown and Bathurst and travelled herself by dray, taking groups of individuals to the hinterland for employment, and supervising their terms of work agreement. However, her ability to publicize her own good work in pamphlets such as Female Immigration:Female Immigration considered in a Brief Account of the Sydney Immigrants’ Home (Sydney, 1842) and Comfort for the Poor! Meat Three Times a Day!!! Voluntary Information from the People of New South Wales collected in that Colony in 1845-6, (London, 1847) , and before various parliamentary enquiries, has tended to overshadow the achievement of Francis Merewether, the New South Wales Immigration Agent (from 1841-51). He especially, was instrumental in preparing an administrative infrastructure–immigrant depots in Sydney and rural districts, making hiring arrangements– that was resurrected when Government Assisted Immigration recommenced in 1847. Caroline Chisholm was a strong advocate of family values and the importance of careful selection of migrants. “Under a good system the very best girls would emigrate”, she emphasized to the New South Wales Legislative Council Select Committee on Immigration in September 1845. The very next day, 5 September, Francis Merewether also stressed how important female immigration was but it was he who suggested to the Committee, “I am informed that the difficulty of procuring female servants for the Colony is very great, and certainly those sent out during the past eighteen months were generally very inferior in every respect to the male immigrants. Some of the female orphan institutions of the Mother Country might perhaps supply useful servants: but I am not sufficiently informed upon the subject to do more than throw out the suggestion.” (My italics) Merewether dealt with, cared for and distributed throughout the colony of New South Wales a much larger number of migrants than Caroline Chisholm ever did. Yet Caroline Chisholm undoubtedly had influence on the formulation of British Imperial government’s emigration policy in the period between 1846 and 1848, at the very time when government assisted emigration was being renewed. She and her family had returned to England in 1846. She herself appeared before a House of Lords Select Committee on Colonization from Ireland in July 1847 and submitted “I should not feel the Interest I do in Female Emigration if I did not look beyond providing Families with Female Servants–if i did not know how much they are required as Wives, and how much moral Good may be done in this Way.” Her quintessential Victorian values coincided with those in her network of friends and politicians. She was adept at gaining publicity for herself and in promoting what we might call ‘family reunion’. She also forcefully argued the case for the emigration of single females and for the proper treatment of newly arrived migrants, no mean feat. Yet nowhere have I seen where she recommended sending female migrants from Irish workhouses. However, a direct appeal was made by Archibald Cunninghame, a pastoralist sent by his fellow colonists of the Port Phillip District to appear before that same House of Lords Select Committee on Colonisation. On 12 and 16 July 1847 Cunninghame presented a detailed and attractive plan for the emigration of Irish orphans, both male and female. While his proposal differed from the one that was eventually put forward by the Colonial Land and Emigration Commissioners (CLEC) early in 1848, not least on the question of who was to pay, there are enough similarities between his scheme and the one that was adopted for us to realize he may have had a formative influence on what became known as Earl Grey’s Irish female orphan scheme. “And Orphan Girls, whose fate in this Country one can scarcely think of without a Shudder, would when their Apprenticeship in the Colony had expired find a ready and well-paid Demand for their Labour as single Girls, and the Certainty, if well conducted, of soon being respectably married” (A. Cunninghame Esq., before Select Committee 16 July 1847). In a letter to H. Merivale, Under-Secretary for the Colonial Department, a year later, dated 6 June 1848, commenting on the CLEC proposal, Cunninghame showed he was under no illusions about the importance of his own role in the affair, “As the plan for orphan emigration was, I believe, originally brought forward by myself…it will naturally be supposed that I take a direct interest in its success”. Clearly, the idea of sending orphans from Irish workhouses was ‘in the air’ among parliamentarians in both England and Australia at this time. Earl Grey, Secretary of State for the Colonies, had received a similar suggestion directly from Governor Fitzroy in New South Wales and from Governor Robe of South Australia. According to Archibald Boyd, when he was trying to persuade Earl Grey that British funds should be used to finance emigration to Australia, “the noble lord professed to have been there and then struck with a thought…the orphan girls whom the famine of Ireland had cast upon the parishes of that part of the kingdom, it might perhaps be advantageous to have a proportion sent out to the Australian colonies, on such terms as would divide the expense between the colonies and the parishes.” (see Sydney Morning Herald 13 March 1850). In the end, responsibility for the Irish female orphan scheme lay with Earl Grey, Secretary of State for the colonies in Lord John Russell’s Whig government. It was Grey’s decision and his responsibility to set the whole scheme in motion. The point I’m also making is that the decision to send female orphans was made by the Imperial government but it was not a dictatorial whim, something which Earl Grey plucked out of the blue as the fancy took him. He had listened to government officials in Australia, Governors Robe and Fitzroy and even perhaps, Immigration Agent Merewether as well as representatives of Australian pastoralists such as Archibald Cunninghame. Yet in another sense, the real architects of the scheme were the Colonial Land and Emigration Commissioners in London who by that stage (1847-48) were responsible for land policy throughout the British Empire. It was they who would draw up the details, and fine-tune how the scheme actually worked. We will also need to put the scheme into historical context; the Earl Grey female orphan scheme was but one of a number of similar ‘schemes’ emerging in the late 1840s. Other schemes included bringing out the children of earlier Bounty migrants to join their parents, if they agreed to come; bringing out members of convicts’ families, if they desired to come, and trialling the migration of other ‘orphans’ from the remnants of Dublin and Cork Foundling Hospitals and other charitable institutions, though these last may have had less choice. Grey even attempted to renew convict transportation, much to the ire of colonists. But the major interest and major push was for the revival, renewal and extension of Government Assisted Emigration, designed to supply agricultural labour and domestic servants for pastoral interests in Australia. At the same time, it was what the Imperial government believed was the right kind of social engineering. We should be aware, too, that the administrative machinery for Government Assisted Emigration (which already drew on the experience of convict transportation and Bounty migration) would be a very useful foundation for the emigration of adolescent females from Irish workhouses between 1848 and 1850. There are, of course, other contexts, –the Great Irish Famine, the voyage, what happened to the young women in Australia– but more of that later. This entry was tagged Archibald Cunninghame, Caroline Chisholm, Earl Grey, Francis Merewether, Government Assisted migration to Australia, House of Lords Select Committee 1847, Liz Rushen, Origins of Earl Grey's Irish female orphan scheme, Secretary of State for the colonies. Bookmark the permalink. Trevor, Dpo you have any more information on Mary McMasters, arrived per Diadem in Melbourne 1850 from Armagh, other members of her family went to America, have a letter from her brother that he sent to her in Tasmanian, ( Mary is my husbands GGGrandmother). You might like to have a look at http://www.irishfaminememorial.org They’d love to hear from you too. Hi Trevor, thanks for your email. It was great to hear from you. I am a great fan of your Barefoot and Pregnant and have used it extensively as a reference when creating pages on the PROV Wiki. Now that I am retired, I am hoping to get the opportunity to continue inputting to PROV’s site. Thank you for replying to my request for information on my Great great grandmother Irish Orphan Mary Loughlin. The girls travelled to Plymouth then sailed on the Eliza Caroline arriving in Port Phillip in 1850. While searching for other Irish Family members in County Kerry I was able to purchase an interesting book that you may be familiar with “The Kerry Girls” Emigration and the Earl Grey Scheme written by Kay Moloney Caball published The History Press Ireland this year (2014). It highlights the story of a number of Kerry girls who would have shared a similar start to our Mary. The thought occures to me that a similar book might be written about the 22 Sligo that sailed to Australia as the second batch from the Sligo Workhouse in 1849. Thank you again for taking the time to answer my query, I will now follow you journey on your web site and endevour to learn more about the background to the Irish Famine and it’s effect on early Irish emigration to Australia. Would to happy to assist in any way if required please advise. Thanks Perry. Will be saying something about Board of Guardian Minute Books in the third post. Do you agree with what I’ve said in the second one? Or maybe I’m not being critical enough of the “imperialists”? Hi Trevor, great to see this. Great work and god luck with it. Do you know anyone in the South Australia Genealogy and Heraldic society who could help ? I first started being interested in the ‘Earl Grey Orphans” a few years ago when I was trying to trace the parents of my GG-Grandmother, Elizabeth Boyd.born c1833 and arrived in S.A. before 1850. She seems to be a prime candidate to be an orphan ,about the right age and no relatives in Adelaide despite exhaustive research. I then started looking for other Boyd’s hoping to find a connection and I am still looking !! Anyway I found a Catherine Boyd from Strabane who was kind enough to die in Victoria and so her death certificate gave the necessary evidence for her to be an orphan. Perry added her name to the list of orphans on the famine website. The other lady is Mary Ann McMullan who married Edward Boyd in Adelaide and later moved to Queensland .Her place of origin is shown as Armagh. Again no Relly’s. I have been in contact with Pat Roberts from the SAGHS but that was about 3 years ago. I have become quite proficient with Irish Family History even though that was not my original intention. I will make some investigations about these “Murray” girls and see what I can find. I do not have a copy of your books but I can easily refer to them at the local Library. I won’t be able to make it to “The Gathering” as I will have to go to Darwin soon, but hope it is a success and I will keep you informed of the results of my research. But as most of the young women on the “Roman Emperor” came from Northern Workhouses, we might be able to find something. Maybe someday someone would check the list of workhouses they came from (see Barefoot, 2, p.397) and then look for young women in surviving Indoor Registers say between the ages of 15 and 20 who may have left their workhouse about a week or ten days before their vessel sailed from Plymouth. The Rom. Emp. sailed 27 July 1848. It would be’guess’ or ‘ghost’list(?). I did have a quick stab at that when last I visited those archives in 2008 and would have put up on the website what i found. But it was a quick visit in 2008 and probably needs someone there to do it properly. They all seem to have “materialized” in Adelaide in about 1848.Despite extensive research I have not been able to find parents or siblings or any other relatives for that matter who could have come out with them They were all in their teens and all came from Ireland. Thanks for your reply and opinion. Yes we will agree to disagree of course, although I feel Cormac O’ Grada (with all due respect) is somewhat a revisionist. I will be following your work. Take care and good luck. Good luck with your blog. Very interesting. Subject: The waifs of Wexford. I gazed upon this day. the misery spawned within now silent walls. when burly matron turned them from their beds. those innocents knew not what day would bring. To be presented with their paltry ration. This day the girls would leave their native land. to face the constant scorn of nasty preachers. The leering eyes of men who wished to stain them. Without development to bear their children. Some too succumb to suicide, in preference to their misery in life. Remember that each grey stone witnessed sin. The exportations of the child within. Where’s the poem from Joe? This poem is my own work as I have a big interest in the Gorta Mor/ Great hunger/ and the events of the time. I have many poems written with regard to the era of the ‘Famine’. 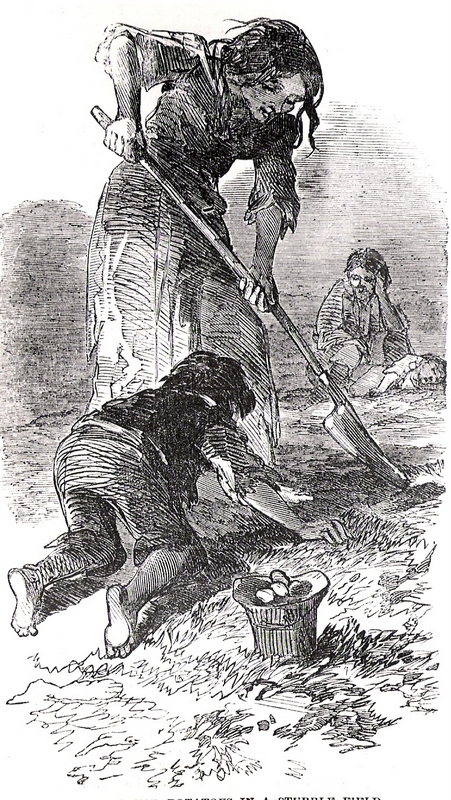 I am of the belief that the word “famine” is a word that is misleading and that our people past and present have misled and falsely taught the whole truth in our Irish schools over the years that millions of our forebears died of starvation because the potato crop failed, It bewilders me that the people of Ireland and indeed the pupil, including myself, that am now in my early sixties did not ask the question,….”What happened the other foods that were exported to feed the rest of Britain whilst we died in the ditches? I have written many poems on the ‘hunger’ years in the hope of one day publishing and making it easier for the uninformed pupil to digest the poem and question the actual actions of those in power at the time and their laissez faire policies in the interests of commercialism to the detriment of our forebears. Many of my poems can be found by Googling , Joe Canning poetry. My poems or verse can be found on the wordpress of a brilliant informative site called. ‘Stair na hEireann’ on facebook..I would be failing in truth if I said to you that I believe the actions of the time were tantamount to genocide, if not in fact genocide. I am an Admin of a petition on the subject of the Great Hunger that is trying to get future generations including an ever learning Diaspora to tell the world of the acyual hell Ireland’s people endured at the hands of people like Trevelyan. John Russell’s Whig Govt. and indeed the underhand and conniving tactics of the likes of the Earl Grey to make his programme of ‘ethnic cleansing look respectable. I applaud you for you work. I am of the opinion that the world must know the truth and that people like you and I are putting it out there in our own way. It would be misleading of me to not tell you about an existing petition http://www.petitions24.com/when_famine_became_genocide_ireland_1845_1850 I wish you nothing but success in this venture and hope to hear from you. Kind regards, Joe Canning. We’re going to have to agree to disagree on this Joe. I’m more persuaded by the evidence and arguments presented by Irish historians such as Cormac O’Grada, Liam Kennedy, David Fitzpatrick–there’s quite a long list–. I’ve been impressed by the work of historical geographers recently, particularly the “Atlas of the Great Irish Famine” eds., Crowley, Smyth and Murphy and David Nally’s “Human Encumbrances”. The views expressed there don’t always sit easily with one another. But I’ve always believed history is about different interpretations and debate. That’s why i find it endlessly fascinating. Is that a message for Jan asking who the Great Grandma is? And did i happen to pass some BPP re fos to you? More likely threw them out in a fit ofabsentmindedness or senior moment! Congratulations Trevor on starting your blog. I’m sure many orphan girl decendants like myself, will read with great interest. Thankyou Karen. Best wishes for your own project(s) on the orphans. Go for it. I’m sure the more there are, the more we’ll learn. I’ll be doing this very, very slowly.